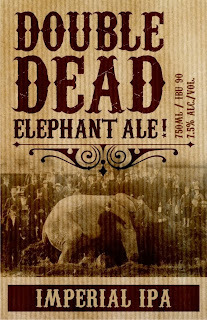 Railway City Brewing proudly released this year’s Double Dead Elephant at their September 19th, Thursday Night Release Event at the St. Thomas brewery. freight train on September 15, 1885. Made with locally grown hops from the Vandelsyke Farm near Vienna, Elgin County, about 15 minutes to the east of the brewery, this years recipe was enhanced so that it is actually considered an Imperial IPA. With increased hops along with grains the end result managed to increase the I.B.U. 's to 90 and the alcohol is now sitting at 7.5% ABV. This year it is definitely a Double Dead!